If you are looking to buy 1000 litres distilled water, then look not further! The Distilled Water Company supplies IBC (Intermediate Bulk Container) containers of 1000 litres of distilled water to manufacturing and business customers. Our distilled water is industrially distilled, and certification is available upon request. For quantities of 160 - 1000 litres of distilled water we will dispatch the water on pallet deliveries in 10 or 20 litre jerry can containers across the UK. 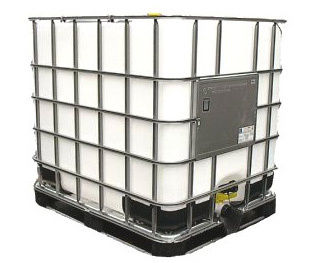 Price for a full IBC container of distilled water includes VAT and delivery to one UK mainland address. If you want to discuss bulk orders of containers or delivery options please contact us. * Please note that we are currently experiencing extended lead times on delivery. Deliveries are expected to be completed in early February. Observe use-by dates storing away from direct light, heat, chemicals or contaminants. Any water unused or left in opened containers degrades rapidly and at the end of the day should be discarded. We do not recommend the use of distilled water for human consumption. Shipping is included in the cost of your containers. If you order before 12pm we will aim to dispatch your order to arrive on a 2 working day service. Distilled water can only be sent to mainland UK, any orders outside of this area will be rejected.